Whether or not you’re into websites like Facebook and games like Second Life is very much a matter of taste, but have you ever wondered how the pair would taste when mashed together into a rich Web 2.0 fricassee? That odd recipe is exactly the formula chosen by US software firm Vivaty in taking the flat world of Facebook’s walls and favourites lists and placing them in a more game-like three-dimensional environment. 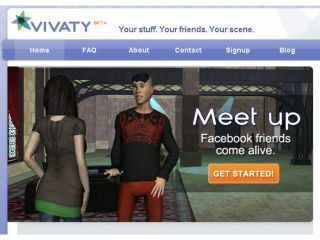 The Vivaty software, which will appear as an add-on to Facebook this summer, gives users their own 3D rooms, within which they can display content as they please and can add furniture or have face-to-face virtual chats with online friends. There’s nothing particularly new about such virtual arenas, but Vivaty’s approach of creating them entirely through a web browser sets it apart from power-hungry applications like Second Life. So, they're talking about a Facebook application -- now, correct me if I'm wrong, but doesn't that involve writing code? In other words, creating software? Come on Vivaty - we were starting to like you before your PR goons got in touch.